The LEITRA is a new type of non-motorized vehicle designed for commuting, shopping, distribution of light goods, recreation and touring. 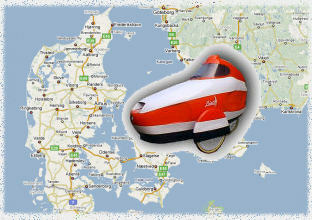 The international term for this type of vehicle is a velomobile. It is fast, but not designed specifically for racing. reliability in daily operation – also in wintertime. For fair weather use the fairing can be removed in a second by activating a snap-coupling with the tip of the toe. The two luggage compartments can also be removed quickly without tools. The LEITRA was approved by the Danish authorities for general use after systematic tests in 1982. The approval was given on the condition that the cyclist should have free access to give signals for turn and stop with an arm. This explains the characteristic open design of the fairing with soft fabric on both sides. Also the built-in back mirror on top of the fairing was approved by the authorities. The first LEITRA was built in 1980. Since 1982 it has successfully participated in many tough rallies in Europe, such as Trondheim – Oslo (1983) and Paris-Brest-Paris (1987). It has proven to be a real practical vehicle for long distance touring. Several million kilometers have been covered without personal injuries. With its three wheels the LEITRA will not overturn on a slippery road. A low center of gravity (typically 35 cm over the ground) and a wide gauge (90 cm) of the front wheels reduce the risk of overturning. The steering is not affected by extra luggage load, because the luggage is kept low, under the seat. At starts and stops, e.g. at traffic lights, it is not necessary to get on and off the bike. The cyclist can sit relaxed, ready to start. In city traffic, it is important that the cyclist is able to accelerate along with the traffic. The LEITRA has an excellent acceleration ability because of low weight, suitable gearing, and an efficient back and loin support provided by the seat. The special LEITRA steering geometry provides a unique manoeuvreability, with a correct coordination of the front wheel steering (Ackermann) even at a turning radius as small as 2 meters. Steering can be performed with right or left hand, or both. The control levers are located at the front end of the arm rests. The LEITRA has brakes on all three wheels. About 40% of the weight of the cycle and cyclist is concentrated on the rear wheel, which is furnished with a rim brake (standard), a drum brake or a disc brake. Blocking of the rear wheel should be avoided by sensible and moderate operation of the brake. Violent braking will cause the rear wheel to skid and will spoil the tyre, or in extreme cases result in an overturn. If the vehicle should be forced into an overturn, the cyclist is protected by the frame and the fairing. The frame is a space frame surrounding the rider. It has proven to give an efficient protection of the rider, also in the case of collisions. The rider has a good view in all directions. In forward direction and to the sides the cyclist looks through the front screen. The field of vision in the backward direction is covered by a convex mirror on top of the fairing. The visibility through the front screen is not significantly affected by normal rain, but fine rain, fog and slush may restrict the visibility severely. Therefore, the front screen of a LEITRA is designed with a flat front section. This makes it possible to install a laminated glass window with a wiper in the critical view sector. The front screen is furnished with a special fresh air ventilation duct, which leads an air flow to the inside and thereby prevents formation of dew and ice on the inside. The system works well, when the LEITRA is moving. Good head and tail light is important, in particular on dark country roads with bad weather conditions. The Leitra has as standard 6 V Halogene front light and diode tail light with rechargeable battery. It can also be furnished with a more powerful 12 V system. A cat eye is mounted below the tail light, and reflective tape is used on fenders, the sides of the fairing and the wheels and tires. Signaling for turn and stop can be made with the arms . Each side of the fairing has an opening for the arm. In some countries it is permitted to add an electric turn indicator on bicycles. A blinking turn indicator is much better seen in the dark, therefore, Leitra provides a 12 V electric turn indicator for use in countries, where it is legal. Comfort is provided in many ways. The seat is slightly recumbent and shaped for the human body. It supports back, loin and sides, and the frame of the Leitra forms arm rests on each side of the seat. This provides a very comfortable and efficient seating position for pedalling. The seat is made of carbon fiber/epoxy with ventilation holes and may be furnished with cushions (e.g. a sheep skin) if necessary. The seating position is sufficient upright to keep an overview in the traffic. For people, who have never ridden a recumbent bicycle, it takes 1-2 weeks to train the leg muscles in the new cycle position. The aerodynamical shape of the fairing results in a low air resistance, when riding fast and against head wind. Also in side wind the air resistance is considerably lower than on an ordinary bike, and the velomobile gets a push by the sail effect. The rolling resistance depends very much on the road conditions and the tyre pressure. Because the Leitra is fully suspended, it is possible to keep a high tyre pressure in order to minimize rolling resistance without losing comfort. In snow and on soft ground the rolling resistance of a tricycle is higher than that of a conventional bike. All three wheels have shock absorbers made of carbon/glass/epoxy. They reduce noise and vibration and offer a comfortable ride on uneven ground. They also protect the wheels and the frame against dynamic peak loads. This extends the life time of the wheels considerably. The fairing replaces raincoat and overcoat, boots and other weather protection gear. In the wintertime a woolen sweater is usually enough to keep warm. An overcoat is not needed before the temperature is below -10 Centigrade. In summertime shorts and a T-shirt form a suitable outfit, even on chilly nights. which is often the case with shirt fabric. Woollen clothing, which permits transpiration, provides the highest comfort. In fair and warm weather the Leitra can be used without fairing, or as cabrio. Many Leitra-owners prefer to keep the fairing on in strong sun shine in order to protect their skin against sun-burning. When riding in rain or wet snow, the cyclist is protected against cascades of water, slush and mud from the car traffic. The windscreen also keeps out airborn sand, mosquitoes and other objects, which otherwise could hurt the eyes. through ventilation openings in the sides of the fairing and through an air duct taking air from a scoop in the nose. The air inlets are adjustable to provide convenient cooling. The top of the fairing can be quickly removed and replaced by a small windscreen, or the side wind screens can be taken out for extra ventilation and better communication. No other velomobile provides such an easy access to get in and out as the Leitra. The fairing can be opened to a vertical position. This gives plenty of space to get in and out of the vehicle. Acrobatic exercises, as often called for with other velomobiles, are not necessary. In strong wind, one should always open the fairing against the wind ! The front fairing can be removed in two seconds, which is very useful in many practical situations. E.g. 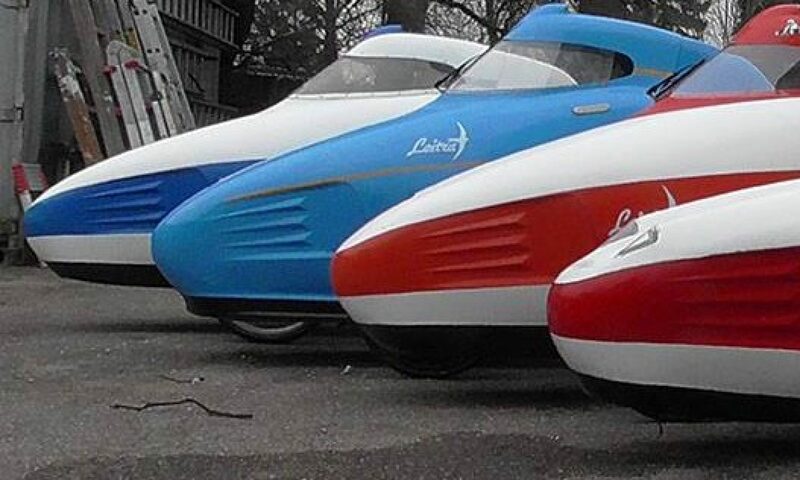 in wintertime, when the velomobile is parked outside and covered by snow and ice in the morning, it is not necessary to scrape the windows, like car drivers use to do with great difficulty. You just snap off the fairing and put it indoor for a few minutes, and it can be cleaned with a cloth. Luggage can be stored in two luggage compartments under the seat, or in the tail fairing. The tail fairing can be either fixed, hinged or replaced by a closed luggage box with hinged cover. Special versions of the luggage box have been made for children, dogs or other small passengers. Finally, a few words about the gearing (more in technical specifications). Almost any gearing can be built into a Leitra. For commuting and touring the standard gearing is a SACHS/SRAM 3 x 7/8 or the more expensive Rohloff 14 speed hub. A front shifter is not particularly well suited for a Leitra, because it gives complications with the chain guard. Generally one uses the gearshift much more than on a conventional bicycle, because the velomobile is slower uphill and faster downhill. There is no reverse gear. You simply put a foot or two down on the ground and pushes backwards.